When it comes to risk reduction, think of us as your front line resource and advocate. We offer comprehensive specialty services to exceed your practice needs. Clients choose us for our ability to simplify complex regulations, provide easy-to-implement solutions, and deliver a user-friendly operational experience. All practices regardless of the size face multi-faceted risk exposures. 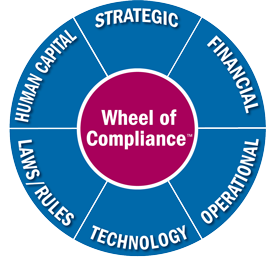 Therefore, we employ our Wheel of Compliance™ Philosophy to assess your individual practice needs. Our professional consulting services provide results-driven solutions for you and your team. Whether you select on-site analysis and live training or e-mail and telephone consultation, we create a custom management action plan to improve your practice environment. Linda’s unparalleled risk management credentials coupled with her extensive dental background enable her to integrate regulatory statutes into your practice to close gaps in your policies, procedures, and workflow. Choose Linda today for unparalleled credentials and experience! Your decision will restore peace of mind and enjoyment to your practice. Read more about our offerings for dental professionals. Having worked in corporate risk management, Linda understands the risks unique to outpatient ambulatory facilities and private practice settings. She guides medical professionals through quality assessments, risk analysis, and customized training. Read more about our offerings for medical professionals. Identity theft has been the #1 consumer complaint to the Federal Trade Commission for the past 11 years. This growing crime impacts patients, staff, and your practice. Stolen identities lead to medical identity theft and many other significant issues. When identity theft occurs to a member of your team, it results in distractions and stress. Because we feel so strongly about this issue, we offer this training at no cost (travel expenses may apply). We couple a voluntary Identity Theft employee benefit with the training to provide you an unparalleled service. This program enables you to build a thorough risk mitigation plan related to sensitive patient and employee information. Read more about our Identity Theft & Privacy Protection Service. The HITECH Act of 2009 gave HIPAA its teeth. Being fully prepared for federally-mandated HIPAA audits and/or potential data breaches is critical. If you are still relying on your Privacy Polices from 2003, you may not be as protected as you think you are. We can assist you with remote or on-site assistance in the areas of manual review, business associate audits, review of electronic security using the National Institutes for Standards and Technology (NIST) guidelines, and staff training. Use our HIPAA Checklist to take a quick look at how you are doing. Click here to view our HIPAA manual. We partner with Bent Ericksen and Associates to bring you comprehensive employment and hiring tools and coaching. Sound recruiting, hiring, and retention policies improve morale and reduce stress in the workplace. Take our 4-Minute Self Evaluation to see how your employment practices rate. Quality and risk have an inverse relationship. Maintaining high quality and safety standards reduces risk in your practice. A comprehensive assessment allows you to proactively implement improvement processes before an accident, error, or lawsuit occurs. Want to be prepared for a surprise regulatory inspection (OSHA, HIPAA, or other state/federal audit)? Leverage this comprehensive service to close regulatory gaps, prepare staff to manage inspections, and give you peace of mind. Whether it’s a surprise audit or some type of mishap, risk can raise its ugly head when you least expect it. Our Enterprise Risk Management and Platinum Strategies are ideal when you need a proven strategy to mitigate or remediate a problem. Regardless of how small or large your remediation needs, leverage our expertise to develop a custom plan of action and get your practice back on track. We have a 10-year history of providing remedial recordkeeping and risk management programs to fulfill disciplinary sanctions across the nation. Our courses are pre-approved by the Florida Board of Dentistry and have been approved on a case-by-case basis in other states, such as Virginia and Texas. Whether you need a self-study or live in-person course, we can help reduce your frustration and make meeting mandatory requirements easy. We have experience working with both dental and medical licensing boards. Check out our Risk Prevention learning programs. Contact Us today to discuss how we can safeguard your practice!